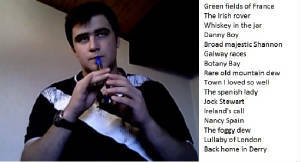 Learning The Tin Whistle, here's a few of my own videos to help you learn how to get started playing tin whistle music. Most of the songs are easy to play along with. Just the first verse is played unless there's a chorus, otherwise the song repeats itself for all the verses. The whistle I use is a Susato in the key of D and is made from plastic. Some of the songs here already have the sheet music in the sheet music section, others don't. There are nearly 40 videos now on the site showing you the basics and a bit more. 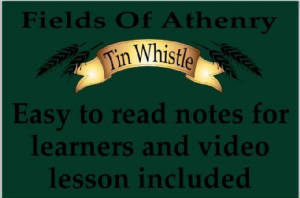 There are thousands of visitors who come here to learn the notes, most are complete beginners, for this reason I have compiled many easy to read songs with the tin whistle ''Letter'' note above the lyric of the song and all have a youtube video showing the music being played. If you would like to have your video displayed on the site then let me know. Keep in mind the learners who just want to play the song without too much ornamentation. The star of The Co. Down is one of the most popular tunes on the site and was written way back in the 1800's by Cathal McGarvey. On a scale of 1-10 on it's level of difficulty to play the song it's about 4. As with all in this section there's a video and letter notes to help you on your way. The Fields Of Athenry is a must to learn. It's one of the finest ballads ever written and known the world over. 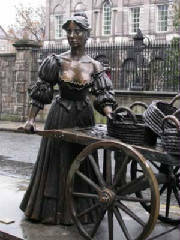 Written by Pete St. John the story centres around a small town in the west of Ireland during The Great Hunger. Level of difficulty about 5. Wild Mountain / Go Lassie Go is an old Scottish tune. It's popularity in Ireland is due to The Clancy Brother who sang it with such great harmonies during the concerts. It's still a favorite today. Level of difficulty about 3. Happy Birthday is another one that every whistle player should know as you never know when you'll be asked to play it. Like Michael Row Your Boat it's most likely one of the shortest tunes ever composed. Dirty Old Town is a little gem of a song. It's not as easy as the others here and takes a lot of practise. Just because a song is very familar to you and you know every word doesn't mean you'll be able to play it first time. Level of difficulty about a 5. From the singing of Luke Kelly from The Dubliners. 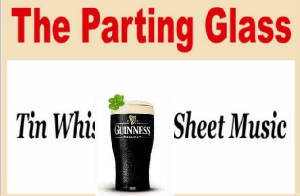 The Parting Glass is another which I learned from The Clancy Brothers and later from The Pogues. It's known the world over and one that's generally sang at the end of a session. Level of difficulty about 2. 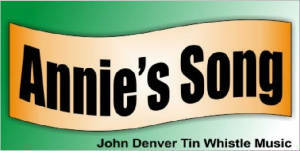 Annie's Song by John Denver. It's a great tune to learn and a bit of a diversion from the old folk stuff. This was requested and I never tried it before the request. I was surprised how easy it was to play. For a novice whistle player you should have it off in no time. The Wild Rover is one of those folk songs that is known all over the world. 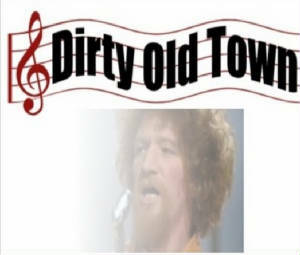 If you ask most people of it's origins they'd say it was an Irish song, well anybody who is into folk music knows that it's an English song that made it's way to Ireland like many other, including Dirty Old Town. Amazing Grace is a Christian song / hymme 1771. It's known all over the world. It's not too hard to play and I'd regard the tune as a stepping stone from the children's section to the songs I included here. Whiskey in the Jar is another one well worth learning as the whole world seems to know it. Made famous as a folk song by The Clancys and The Dubliners but then it got turned into a rock song by Thin Lizzy and metallica. I given a few different versions in case the key does not suit. I have had plenty of requests for Amhrán na bhFiann / The Soldier's Song which is the Irish National Anthem. 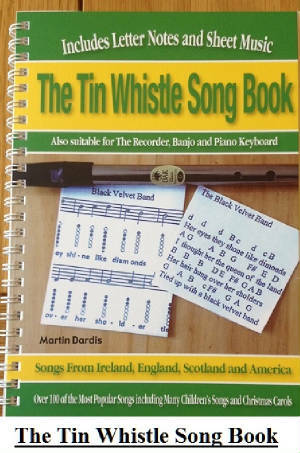 It's not exactly one for beginners but if you plan to keep playing the whistle and if your Irish you'll have to get around to playing it at some stage. Again my advice is to break it down and learn it line by line. I use a Generation make whistle in the key of C to keep it from sreeching as it goes up as far as the high F.. The link is in the first page of sheet music. Back to basics today with an old Irish rebel song from the 1800s by Thomas Davis called The West Awake. It's handy to play and doesn't go too high, it's a slow air. The link is in the second page of the sheet music section. Some tunes sound dreadful when playing them on the D, especially when they reach up to the high F an G notes. I took out the battered up old C whistle again for todays song which was The Patriot Game which is about Fergal O'Hanlon and written by Dominic Behan. It's one of the most will known of all the rebel songs but you'll seldom hear it being played as a stand alone instrumental piece of music. It's a little bit tricky as it goes straight from the high to the low D from one word to the next. From a tricky song to the most simple, included today were the ABC song and Baa Baa Black Sheep which are basically the same tune with slight variations. Both of which are for children to learn. Another one in the kids section is The Connemara Cradle song which was made popular by Delia Murphy [1902 1971] who came from Co. Mayo. It's a step above what you'd learn starting off before what's known as intermediate. Morning Has Broken has probibly never been played before of the whistle, it's a beautiful tune so I decided to give it a try, it was well worth learning. I was surprised to hear the song was over a hundred years old, I always thaught it was a recent pop song from the 1970's. Other updates since Christmas have been My Bonny Lies Over The Ocean where I have placed the link in the Children's section. Here I Am Lord with a version on the piano keyboard which again is handy to play along with. Red River Valley was on the site for years but I have only just got around to adding a video. And the final one is by The Dubliners Come My Little Son from the singing of Luke Kelly, again there's a video showing which notes to play. The link is in the first page of the Sheet Music And Tin Whistle Notes. I'll continue to ad more as I find the time. I hope this helps. The Key of G consists of one sharp which is F#. The scale is G A B C D E F# G.
Say for example, I wrote the piece in the key of D, there would then be two sharps which are F# and C#. In my book on the right you don't need to be able to read sheet music to play the songs. I give the simple letter notes along with the sheet music for all the songs. It's a great big book for all ages. There are 119 songs in total including a raft of well known folk, ballads and children's songs. The above is what a standard piece of whistle sheet music looks like. It's for an old folk song ''There's A Hole In The Bucket'' . It doesn't go any higher than the B note so it's a great way to get yourself familiar with reading sheets. 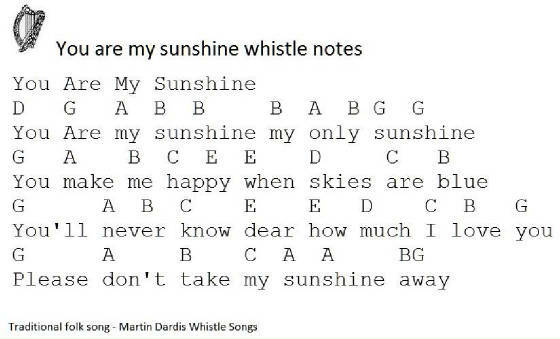 If you are only starting to learn the whistle I would recommend an easy song to begin with for obvious reasons. It's pretty much the same as any instrument starting out. If you were learning the piano you wouldn't start with ''Rachmaninoff third piano concerto'' . It's the same with the penny whistle. Most of the Childrens Songs here on the site are handy to play when starting out, so that's where I'd recommend you to start. Pick one that your familiar with. Learn it one line at a time and then put the whole thing together. 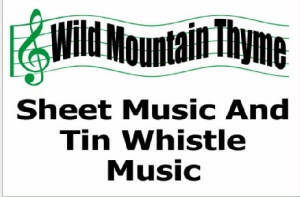 After you have mastered the Childrens songs I would then have a go at Come By The Hills, you will have learned a lot from the kids section and know where each note is on the whistle. Don't be tempted to try and play the difficult stuff before you are ready, it can be frustrating but you must be patient. After Come By The Hills try another that's not too hard, such as My Heart Will Go On which is very basic. Two more easy ones to learn and are not even folk songs are Love Me Tender and Woden Heart. After you have learned these and really know them off by heart it would be time to try the intermediate songs such as Dirty Old Town and The Star Of The Co. Down. If you follow this advice you won't be so frustrated to the point of giving up. The first written piece of musical notation to appear in Ireland comes from the 12th century and Staff notation has been available to buy since the 18th century. These were written mainly for piano. Tin Whistle ''Tabs'' didn't appear until much later as the instrument was not widely used. Many traditional musicians today can read music thanks to the first publication of Francis O'Neill's wonderful collection of tunes in the first part of the 20th century. For the vast majority of traditional musicians the use of sheet music is only a guide for getting the basics of the tune off. Centuries before books came about the tunes were passed on orally and even the musicians that do read sheet music still find that listening to a tune played at a session will give them a feeling for a tune, such as variations in the melody and timing. The ornamentation of a tune is hard to capture through notation alone. 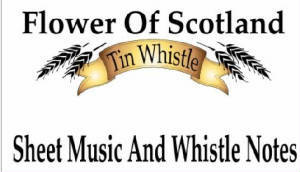 The introduction of charts showing where to place fingers on the holes of the whistle were a God-Send for many whistle pupils and has certainly increased the number of people taking up the whistle. Lets face it some people just haven't got the ear for picking up a tune and relay on the written notation. Some of these people go on to develop an ear for music after spending some time reading the tune from sheets. So this is a good thing and should be encouraged, although some music teachers frown upon learning by reading music. My position is that what ever system works for you to learn how to play the whistle or any instrument then go for it. and finger the tune exactly the same way. or C instead od D Major.